We recently sat down and interviewed one of our amazing volunteers here at the museum, Sandra Sitkowski. Below is the transcript of the conversation with this great woman who contributes so much to the DHM. We hope you enjoy learning more about her. Q: Could you tell me a little bit about where you grew up? A: I was born in Detroit at Henry Ford Hospital in 1933. We just lived right down Lincoln. Lincoln goes right down into the boulevard right at Henry Ford Hospital, and we lived about two blocks down. In 1941 or, I can never remember if it was 1941 or 1942, we moved to Dearborn. We lived on Roosevelt in Dearborn. I lived there until I got married in 1957. We lived for a while on Firestone in East Dearborn in a garage home. It was a garage home it was set way back. Have you seen those? They called them garage homes because they were set way back where a garage would be. It had one bedroom, and wherever you put your furniture that’s where it would stay until you moved out, because it was so small. It had a small, little living room with one of those heaters in the living room. It had a little kitchen, and it had the hot water tank where you had to light it. That was in the kitchen, and the sink was in the back hallway in the bathroom. At the time me and my husband worked at Michigan Central Depot in the office part, and then he went to school. He was going 4 or 5 hours a night. He didn’t get home until around 11 pm, so that little house didn’t bother me. I would go over to my mothers. We had been there 3 years and I finally got pregnant. Then we bought our house and moved out, but you know what? We paid $25 dollars a month, so that when we bought our house we put down a pretty good down payment. We went conventional. We could have gone through the VA, but we went conventional and our interest rate was even cheaper. So $25 a month of living in this little thing helped. Q: Did you attend High School in Dearborn then? A: Dearborn High School I went to grade school here. I went to Edison Junior High School, they called it Junior High in those days, and then the old Dearborn High School. I graduated in 1951. Q: Where was the old Dearborn High School? A: Right down the street on Mason and Garrison, across from that church. Well there’s two churches over there, but just down a few blocks. Q: Did you attend college? A: Now get this. When I got out of school, my girlfriend’s uncle worked at Detroit Edison. He asked my two girlfriend’s and I if we would like a job at Detroit Edison. We all said, “Oh yeah.” He got us in. I worked in the payroll department. I worked on the IBM card punch machines. Now that’s how old I am. I was taking night classes at what then was called Dearborn Junior College. It was the old Miller School on Michigan by Miller Rd. It was a big school. I took night classes, and I think they had day classes too. I had taken, well, I forget how many credits I had. Then, when I was working after my kids were in high school, I was taking classes at Henry Ford Community College. Q: Outside of the museum, what are your interests? A: Well, I do counted cross stitch. I also knit. I do newborn, the preemie hats for Oakwood Hospital. When I get a bag of them I take them over there, and they’re so grateful. So, that’s what I do. Q: How long have you been volunteering here? A: Oh my gosh. I started out working with little Karen Krepps. I call her little Karen, because we had blonde Karen and little Karen. I started with her going through archive boxes from the 30’s. They were thinning them out, and going through pictures and things like that. I started out working with her, and I was probably over there close to a year. Then, we always came over here (to the office) and signed in. I don’t know how I got talking to Marguerite, and she said something about the computers. I said, “Yeah I’ve worked with computers all the way from card machines right up through. She said, “Would you like to come here” and I said, “Well yeah.” So, it has probably been about a year and a half I’ve been here (in the office). Q: You said you were working with Karen. I haven’t met her, but she is the Head Archivist right? A: Yep she is. She is a real nice lady. Everybody here is. That’s what I say, people who volunteer, they have to like their job. If they don’t like it, they won’t do it. It’s not like we’re working a paying job where there is a lot of competition too. I don’t feel any pressure. You just do the best you can. If they’re not satisfied with it, then they’ll let you know. It’s like when I started learning Pass Perfect, oh I didn’t think I was ever going to understand that. Well, I had two different people training me, and they had different ways. It got me so confused. I thought, “What do I do?” I finally told Claire, who was one of the people showing me. I told her at one point, “I’m going to quit and let you get somebody else in here who can understand this and do it.” She kept saying, “Oh you’re doing fine,” and I thought, “Well, if this is called fine I’d fire somebody.” Then all of a sudden, it clicked in. It was there. I still have questions, but I can figure out a lot now. Q: What made you want to volunteer at the museum? A: A friend of mine, who I went to Junior High School with and graduated High School with is David Good’s sister. My friend was his sister, he is the younger one. I remember when he was little. Marilyn Good, Marilyn Brown now. Her and I graduated together. We would go out to lunch all the time with all the girls we graduated with, and we would go to the library book sale every first Wednesday of every month. One day she said to me, “Sandy, would you like to work at the archives over at McFadden-Ross.” I said, “Doing what?” She told me what it was, and I said, “Oh sure why not?” That’s how I got here. I really enjoyed it. We were working with Mr. Waldecker over there. I don’t know how old he was, but he was older. That man had a memory. It was fascinating just to sit and listen to him. I don’t know why someone didn’t interview him extensively with his knowledge of Dearborn. Now, I don’t think he is well. I keep asking Marguerite if she’s heard anything about Mr. Waldecker. He is such a gentleman. He asked me once, “What is your first name? I said, “Sandra.” He said, “do you mind if I call you Sandra?” And I said, “Oh no, no.” He said to me, “My mother must have loved Melvindale, because she named me Melvin, but you can call me Mel.” But you know, I never did I always called him Mr. Waldecker. I couldn’t call him Mel. I don’t know. Ah, such a gentleman. Wonderful guy. Q: Do you have any funny or crazy stories from working here? A: No not really. Other than it’s fun, enjoyable. It gets me out of the house and gives me something to look forward to. It seems like I’ve always volunteered somewhere. Because when I quit work, in 1995, I delivered meals on wheels for 8 years. I did it with my girlfriend, and then she got tired of it. Then my husband retired, and so he drove me. I loved doing that. I loved the people that I had. I started reading the death notices, because I didn’t want to go in and have them tell me that so and so passed away. I loved doing that. Q: Have you done any further volunteer work other than all of this? A: Well, I volunteered for Cub Scouts. I was a Den Leader Coach, a Den mother. We marched in the parade. I loved it, the kids, we always had a good time. Q: What do you like most about volunteering here particularly? A: The people. The people are great. I mean, everybody. It’s an enjoyable thing to come to two days a week. I don’t know if I could do three, but the two I look forward to. I look forward to the people, and the work and it’s interesting. Q: So you have an interest in history then? A: Yeah, you know, I read a lot. All of a sudden it dawned on me, when I’d read our historical novels. I don’t like love stories and all that stuff. I was on a drag for all the different queens of England and France. That was so interesting. Talk about politics there, I mean it’s really interesting. It gives you something to think about, not just fluff stuff. Q: So books about history are your favorite kind to read? A: Yes, the historical novels. The ones that have a little bit of story mixed in them. Q: Has this been an area of interest throughout your whole life? A: Pretty much. I don’t like books about murders, lawyers, police, and most of the popular authors do those. One author, Ken, oh I can see his books. ‘World without End,’ he wrote that. It was a trilogy. It started back in the 1200’s. Oh how people lived then. This one man, Tom the builder. They didn’t have last names in those days, they’d go by their occupation or whatever. He wanted to build a cathedral. It was kind of like his life history. That was so so good. I just enjoyed that so much. Then the second book went on from there. It was all historical. I can’t think of that author’s name. ‘World Without End’ and ‘Pillars of the Earth’ were two parts of the trilogy. Very very good. I mean, I learned things I never thought of, like those people in the 1200’s or late 1100’s, they only had the clothes that they wore. They didn’t have extra clothes. You know, when you think about that, they wore them until they wore out. Then they had to get more clothes. Oh this is terrible. In one part, one of the women had two of her kids with her. They went into the woods, well she just lifted up her dress to go to the bathroom. They didn’t wear underclothes, and I never knew that before. That’s one thing that stuck in my mind. I don’t know these are thousand page books. I read every night before I go to bed. I watch the news, listen to the 10 o’clock weather and then I go and I read. I love reading. Q: This is kind of back tracking a bit here, I meant to ask, why did you decide to take on the responsibilities you did here? A: It was fun to learn. It was something different. I had never used Past Perfect before. 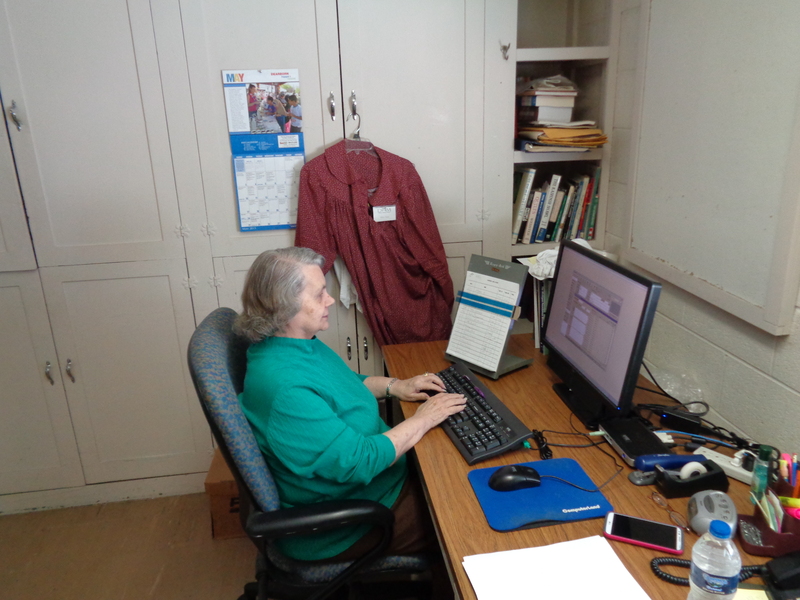 Other than what I do on my computer at home, I hadn’t done work on a computer since, well I used to belong to the Downriver Genealogical Society. I used to do a lot of work on computers for my purposes for Genealogy. Then in the last couple years, I just didn’t have anything to do. I had been out to Salt Lake City, Utah four different times. I mean I had books full of family history, and I kind of got tired of doing that. So, I just wanted to come here and do something interesting. 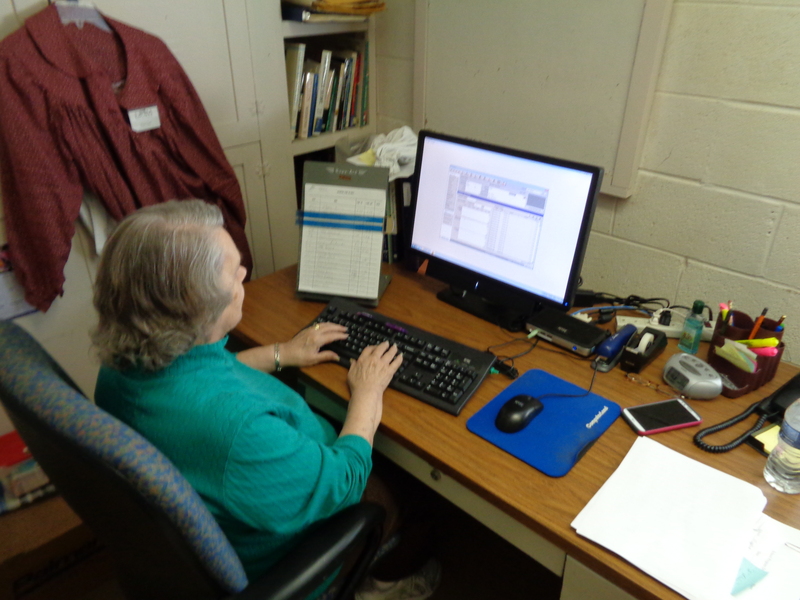 Q: Were you helping other people with their Genealogy there, or your own personal Genealogy? A: Just for myself. For my husband’s mother and dad and my mother and dad. Q: How far back did you go? A: Oh I went way back. My mother’s family came from Sweden and Finland. My husband’s mother was born here but had Italian parents. My husband’s father was born in Poland, and then came here. My dad’s family was all from England, Ireland, Scotland, and Canada. That was the only stuff in English I found. Q: Did you find anyone in your family history that stuck out to you? A: Oh yeah I found some people in jail. Yeah, how about that? On my dad’s side, his grandfather’s name was John Day, my maiden name is Day. The only thing that they had on him was that he was from Ireland. Not even a county. Nothing. So I couldn’t go back. Where am I going to look? I’d have to hit every single county in Ireland. His wife’s family went way back. They were McKenzie’s and they went way back. It was interesting being able to go to Salt Lake City to the Mormon Library. In fact my granddaughter, well today she turned 21, she was born in Moscow. My son and daughter in law adopted her. She wanted me when I went to look for her family, but you know what? Russia and China have never let anyone in to look at their documents, and here it was, Russia. I couldn’t do anything for her. You know what was so wonderful? All of those Mormons go out and do 2 years of duty somewhere, and they were in all these European countries before the First World War and before the Second World War. By the end of the Second World War, everything was rubble. Everything was lost, but the Mormon’s had it all. You know, Salt Lake City is mountainous. They had a vault in this one mountain, they have it all carved out. That is where they keep all of their original microfilms. Q: Is that where you got to do your research? A: No no, we had to go to the library. The library still has everything. If you want copies of it, if you go to any of the other Mormon libraries around, you can request it and they’ll send for it. They only send copies though. The originals, they stay there. Everything there is temperature controlled. It’s not hot, not cold, not wet. Q: Okay I have one last question for you. I noticed your Amethyst ring, were you born in February? A: No, but I was married in February. No, I just love Amethyst. From all of us at the Dearborn Historical Museum, we thank you Sandra for your great service to the cause of history. We are honored to have you as a volunteer at the Museum.